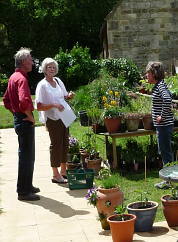 Farmcote Herbs and Chilli Peppers is run by husband and wife team Tim and Jane. It all started as a hobby and just evolved into a herb and chilli business because of our love for good food and attractive and useful plants. Our setting is one of the most beautiful places in the Cotswolds, looking over towards the Malvern Hills and Black Mountains in Wales. It keeps us late on many a summer's evening. The Cotswolds hamlet of Farmcote consists of two farms, six houses in total; and a very pretty little Saxon church. The famous 'Cotswolds Way' walk is nearby, running down to Hailes Abbey. There are many other wonderful walks. Our large selection of culinary and medical herbs include Basils, Corianders, Dill, Borage, Tarragons, Oreganos and many more. Many are sold in two sizes of pots, are pesticide free, of excellent quality - and not hard on the pocket! We also plant for our customer's troughs, bowls and herb planters. We sell various chilli chutneys, salsas,dips, chocolates,oils and Bhut Jolokia sauce. Chilli sausages and chilli burgers are for sale - supplied by Sudeley Hill Farm. The fabulous chilli chocolate include original, peppermint, orange and fruit & spice.